I know I’ve said it before, but…kids eat what they’re used to eating. When we use terms like “kid-friendly” to describe foods and eating habits, what we’re really saying is usually “fried,” “bland,” “breaded,” or “sweetened.” There’s a rampant misconception in America that children’s palates are incapable of handling anything that tastes of, well, REAL food. We have somehow trained ourselves to believe that kids’ taste buds just aren’t viable until sometime after the age of 12 or so, at which point we begin to lament the fact that they won’t try new things, just when we apparently thought they’d be old enough to suddenly turn from a steady diet of hot dogs and macaroni and cheese to pasta primavera and roast duck. I’m only being quasi-facetious. When exactly do we think this magic age and/or developmental stage is supposed to hit? How old is “old enough” to be expected to eat like an adult? And…what does eating like an “adult” even mean? I submit as evidence the following meal, eaten just a little while ago at our dining room table. Nonetheless, they ate. Once they both figured out there was a good deal of salmon in there (and some of it was a favorite of theirs, hot-smoked salmon, which I had in the fridge and added for the extra flavor punch), they were game to at least start digging through the filling and pulling out chunks of fish like pirates digging for treasure. To my boys, smoked salmon of any description goes over just about the same way wild salmon, swimming upstream, goes down with grizzly bears. If they had to skin it and remove the bones themselves, I swear they’d at least give it a shot. Aside from the strudel, the first thing they both went for on their plates was the beets. After our success with beets earlier this week, I thought I’d give them another try — it’s always good to test whether or not a surprising new liking for a food is a fluke or not. 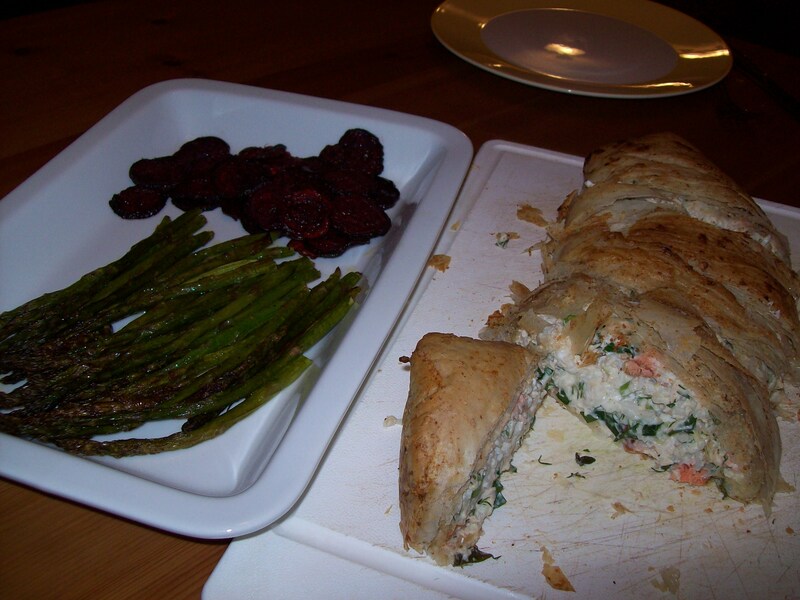 Sure enough, L. downed both the beets and the roasted asparagus without blinking. P. ate some of his beets, then drowned the rest in his milk cup and giggled while the milk turned pink; but I’ll take it. (“Yook, Momma! Mik KINK! Ewww…asgustin’!”) After all, nobody said dinner with an outrageously mischievous 2-year-old should be without its adventures. 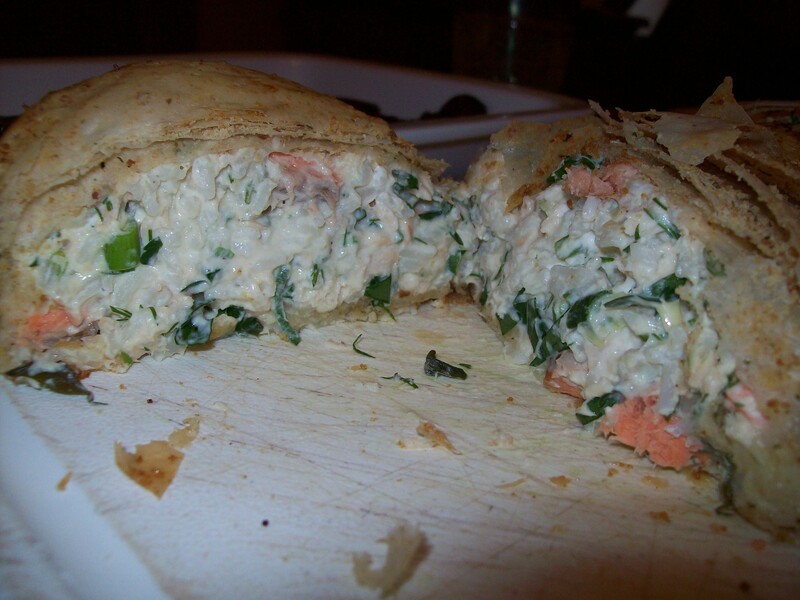 This is one of L.’s top 5 favorite meals, and one of the things P. will absolutely reliably eat, unless something is wrong. We ate it last night, and they just about cleaned their plates. 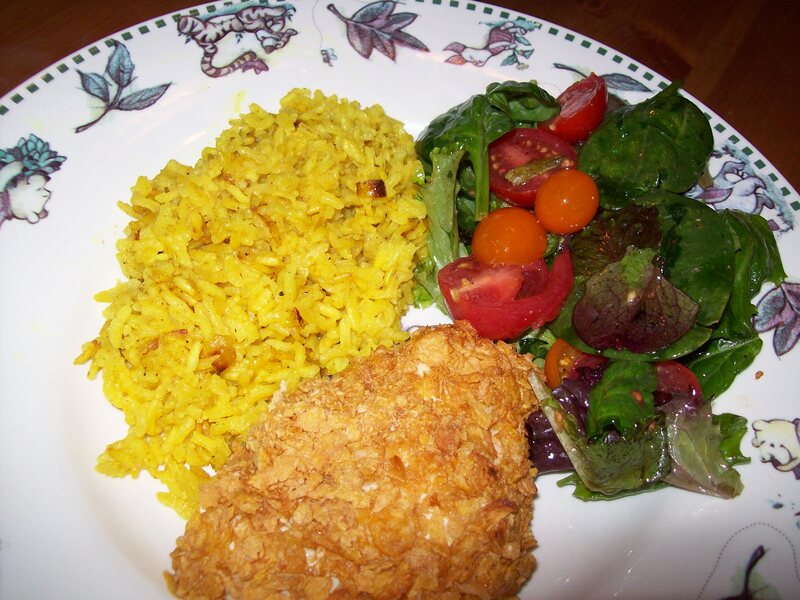 There’s nothing bland about this meal; the rice is cooked with onions and turmeric, and the crushed cereal coating on the chicken (which is the classically “kid-friendly” element) is stuck on with a mixture that includes dijon mustard and Parmesan cheese. There’s a definite flavor profile to this dish. But to my kids, this may as well be chicken nuggets. It’s not because my kids were born with superhuman palates; it’s not because we’re some sort of amazing parents who have figured out how to circumvent all the pitfalls of an ordinary childhood (if that were the case, the phrase “Don’t put your foot in the toilet” would never have crossed my lips, let alone twice in the same week). It’s just because it never really occurred to J. and me that little people should eat like anything other than PEOPLE. We always assumed that if they had to be taught to do everything else like adults, then they’d have to be taught to eat like adults, too — and that, like potty-training, socializing, speaking, dressing, and all other skills, eating reasonable meals couldn’t be left waiting until they were old enough to have gotten used to another way of doing things. As added incentive, once we started educating ourselves about food and figured out what was actually IN so many of the things we think of as “kid-friendly” food items, we decided that it just wasn’t smart parenting to fill kids up with that stuff. Food is not supposed to be a battleground. It’s not supposed to be negotiable. And it’s not supposed to have “age-appropriate” boundaries, at least not once the kids are eating solids. Food is simply the fuel for our bodies; the building material for our children’s behaviors, moods, learning capacities, and personal health. You know, the little things. I know how much better I feel when I eat real food. I’m willing to bet my kids do, too. And that, I think, makes feeding the whole family whole, from-scratch meals the most “kid-friendly” choice of all. This entry was posted in Cooking, Feeding kids, Food culture, Meal planning, Parenting and tagged cooking, family, feeding kids, food, kids' health, meal planning, Michael Pollan, parenting, Sunday dinner, veggies. Bookmark the permalink. I agree completely…and should I ever have children I will definitely not be training their palates to love chicken nuggets and fries! Your last paragraph says it all! I dislike as you state that when you review the kids menu at any restaurant it’s hard to find something nutritional. As if junk food was made for kids. To me, their food shouldn’t be any different than ours, just smaller portions for their smaller tummies. We just feed them off our plate at that point. Plus, saves money and less waste. I don’t feel so bad now to learn that your 2 year old doesn’t always clean his plate. Or that they pick their food. I guess growing up and forced to eat all your food is what gets us in that mentality that you don’t want them to pick at the food you made them. I get frustrated when my 2 yr old picks at her food because she’s a good eater, but for some reason dinner time is a challenge. I do get ecstatic when she eats what I wouldn’t think she’d even touch! I totally agree. My kids hardly know anything but produce and they loooove it. They don’t know any different. I have some posts about their food on my blog too. I always figure if kids in other cultures eat highly spicy food from an early age, or eat strictly vegetarian, or lots of seafood, or whatever…that there’s no reason American kids can’t eat a variety of different foods and flavors too. It’s just our own mindsets that hold us back from exposing them to things. Thanks for stopping by and reading!